1) The garden is well established, and the ownership and management structures are stable and perpetual as far as can be reasonably assessed. 2) The garden is open regularly to the public. 3) Admission may be free, by donation or by set fee as the garden determines for its needs. 4) The garden need not be devoted completely to camellias, but must feature them prominently, accessible and maintained to a high standard in a manner suitable to the garden and its climate. A minimum collection of 200 cultivars or species is required. 5) The garden maintains a register of all its camellias, and their location in the garden. 6) All cultivars and species have identifying labels where known; unknown cultivars should bear labels explaining the lack of identification. 7) The garden has some method of making cultural information available to visiting members of the public. 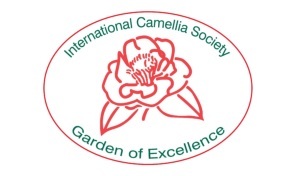 8) The garden shall be a member of the International Camellia Society, and shall agree to display information about the Society, including contact addresses, to be available for prospective members. 9) A current version of the International Camellia Register is readily available for reference purposes. a) Research programmes on camellia culture, heat or cold tolerance, pest or disease control, or other subjects adding to the overall knowledge of camellias. b) Shows or displays during flowering times. d) The maintenance of special theme collections such as species or named sasanqua cultivars. f) Any other initiative by the garden which promotes enthusiasm for and better growing of camellias.